Our synthetic hemp rope is also known as hardy hemp, polyhemp or hempex rope. This synthetic hemp rope has all the appearance of natural hemp rope with the advantages of using a synthetic material. All these advantages and qualities make synthetic hemp rope ideal for outside use such as decking areas, stair ropes, handrails, the boating and marine industry, the construction industry, children's play areas, garden tree rope swings, climbing and fitness gym ropes. The surface of the rope is soft to touch but easy to grip. 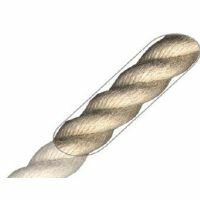 Synthetic hemp rope is available in many sizes and diameters ranging from 6mm upto 36mm. We can supply our synthetic hemp rope in any cut length or in a commercial coil of 220mtrs. We can also offer a next day delivery service to all mainland UK addresses if ordered before 2pm.